With only an hour to go until the Xbox E3 2017 press conference, it seems that some exciting news has been shared. According to Geoff Keighley, producer and creator of The Game Awards, Project Scorpio is set to release with a $499 price tag. This was not the price many fans were hoping to see, but nonetheless, it seems that this will be the starting price point, unless “something changes.” Project Scorpio is packing a pretty beefy rig with 6 teraflops of power and 12 gigabytes of RAM. Earlier this year the full list of hardware specs were detailed; read more here. In addition to the price tag of the console, it also seems that Project Scorpio won’t just be a codename for the console no more. It looks like that new Xbox will actually be called Xbox Scorpio. Coming from a Best Buy newsletter via Twitter user AAMARMO, the site has the new console pegged as “Xbox Scorpio”. At the moment, we don’t have hard concrete evidence that this is true, however, Keighley did follow up his previous Tweet by saying he also knows the name of the console. Keighley ran a poll with 4 different names for the new console and stated that one of them was real. 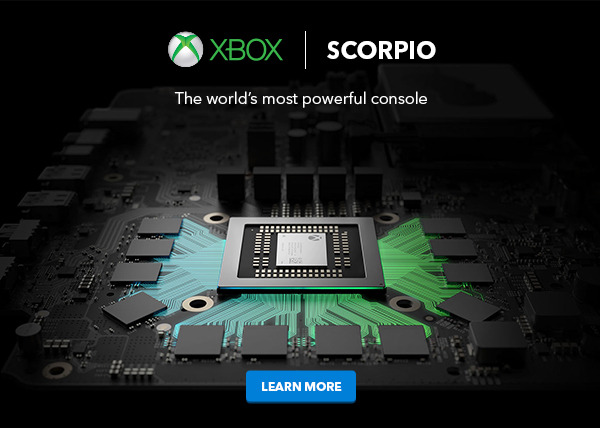 It could easily be something else like the Xbox One X, but it seems that with the hype around the word Scorpio and the Best Buy newsletter, Xbox’s next console will indeed be titled Xbox Scorpio. What do you think Project Scorpio is actually called? Or something else? Either way, with only an hour left until the press conference, fans will hear official details from the man himself Phil Spencer soon enough. If the $499 price tag is true though, has your hype decreased or are you still excited for the new console? Let us know in the comments below!